Browse our wonderful collection of early birthday wishes. Send an unforgettable happy birthday in advance to your boyfriend, girlfriend, husband, wife, family member or friend. 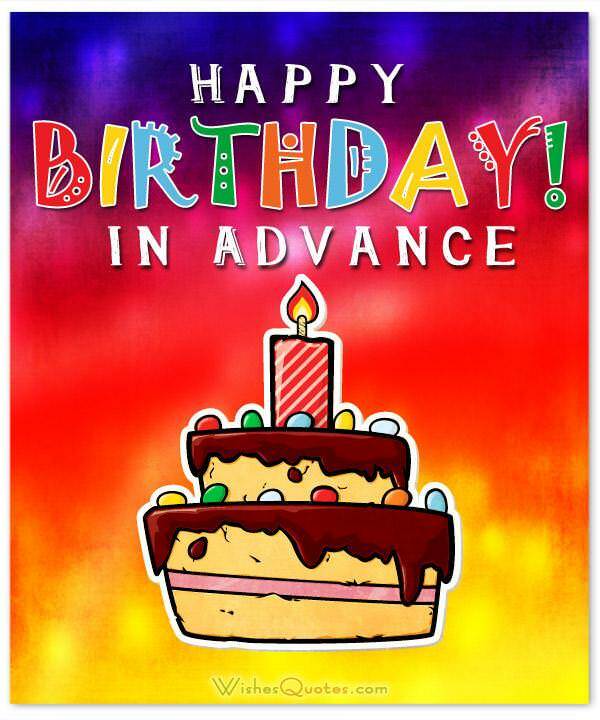 There are lots of ways to wish belated birthdays and the greeting card companies accommodate our widespread tardiness with these specific cards. In our busy world, many of us are constantly running late so we take advantage of those wishes which include a “built-in” apology. However, there are occasions when our birthday wishes either must be sent early, such as out of town commitments, or simply as a desire for being the first and foremost in the onslaught of well-wishers. Regardless of the reason, early birthday greetings are not only welcome, but indicate that the receiver is a constant and prominent part of our everyday thoughts. Being the first to wish them well, whether through social media or a paper greeting, shows that you’ve already started celebrating their special day. Following are some examples of ways to start their party! First in line for meals, first in line for vacations, and first in line for wishing my sweet friend a fabulous birthday. I’m not sure how many times I’m going to want to wish you a Happy Birthday, so I thought I’d better start now. Psssst — Do you know someone very special has a birthday coming up very soon? You do? Me too — Happy Birthday! It’s important to tell friends how much we care LOTS times, so here’s the first of my Happy Birthday wishes to a very important YOU! Before we both get wrapped up (pun intended) in gifts, parties, paparazzi…. I want to be the first to say HAPPY BIRTHDAY! You know that I’m not the least bit competitive, but I’m the first of your friends to say Happy Birthday……nah-nah, nah-nah! Here’s your first birthday wish from me. I want to send you one ON your birthday as well. In fact I like you so much, I’m sending a belated wish too. They say patience is a virtue. You know me better than anyone, so you’ll understand if I say an early Happy Birthday. As a kid, I sometimes got into trouble for my eagerness, but now I WANT to “jump the gun” in wishing you a great and eventful birthday! If the Early Bird catches the worm, what does the Early Birthday Wishes Bird get? I’m not sure, but it SHOULD be major friend points! I was the pathetic kid who got to school dances early when the band was setting up — so here’s your Happy Birthday Wish! You are so special, and your birthdays deserve so much recognition, that I’m starting it off early so you have more time to celebrate. Happy Birthday. Happy Birthday! I know the big night out is next week, but now’s the time to start carbo-loading and taking on fluids. Can’t wait! While deciding between the Porsche and the Tuscan vacation as your birthday gifts, I remembered that you believe it’s the thought that counts. Happy Early Birthday! With your birthday coming up, I remembered how we used to celebrate it like wild dogs…..Wanna bring your PJs’ for pizza and a movie? Since I won’t see you on your actual birthday, I thought it would be WAY less lame to say “Happy Birthday Sweet Friend” early instead of late! We have so many great birthday memories, so I decided to start yours off with a “Happy Birthday Eve” wish. This is an early birthday wish. Now you can start celebrating your Birthday SEASON. (just one day is far too limiting). If retailers can stretch Christmas from one day to three months, I’m starting your birthday celebration NOW.